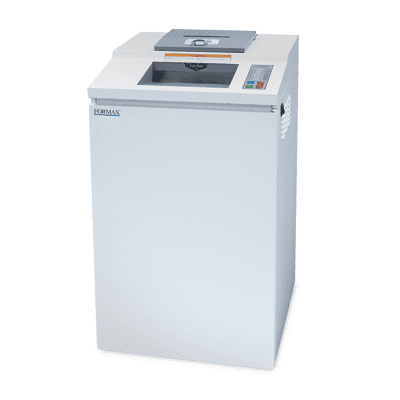 The OnSite FD 8704CC Multimedia Office Shredder offers commercial-grade quality and unmatched features in a compact design ideal for the office environment. It features two dedicated feed openings: one to accept up to 45 sheets of paper at once, and a second feed opening specially designed to shred multiple CDs, DVDs, and DV tapes at one time. Paper can be shred at a speed of up to 12 feet per minute, with a shred size of 5/32" x 1 5/8". The FD 8704CC has a waste bin capacity of up to 33 gallons. Standard features include heat-treated steel blades, an easy-to-use LED control panel, lifetime guaranteed waste bin, and a powerful AC geared-motor. In addition, the new ECO mode saves energy by automatically switching into standby mode after 5 minutes of inactivity. The optional EvenFlow™ Automatic Oiling System helps to keep the FD 8704CC in peak operating condition. Key FeaturesShreds Flash Drives, CD, DVDs, mini DV. Shreds CDs, DVDs, mini DV. Separate infeed for media. LED Control Panel. Energy-saving ECO Mode. Auto Start/Stop, Reverse. Optional oiling system.